"We wanted to figure out methods to graft complete, intact electronic circuits onto colloidal particles," explains Michael Strano, the Carbon C. Dubbs Professor of Chemical Engineering at MIT and senior author of the study, which was published today in the journal Nature Nanotechnology. MIT postdoc Volodymyr Koman is the paper's lead author. "Colloids can access environments and travel in ways that other materials can't," Strano says. Dust particles, for example, can float indefinitely in the air because they are small enough that the random motions imparted by colliding air molecules are stronger than the pull of gravity. Similarly, colloids suspended in liquid will never settle out. Tiny robots made by the MIT team are self-powered, requiring no external power source or even internal batteries. A simple photodiode provides the trickle of electricity that the tiny robots' circuits require to power their computation and memory circuits. That's enough to let them sense information about their environment, store those data in their memory, and then later have the data read out after accomplishing their mission. Such devices could ultimately be a boon for the oil and gas industry, Strano says. Currently, the main way of checking for leaks or other issues in pipelines is to have a crew physically drive along the pipe and inspect it with expensive instruments. In principle, the new devices could be inserted into one end of the pipeline, carried along with the flow, and then removed at the other end, providing a record of the conditions they encountered along the way, including the presence of contaminants that could indicate the location of problem areas. The initial proof-of-concept devices didn't have a timing circuit that would indicate the location of particular data readings, but adding that is part of ongoing work. Most conventional microchips, such as silicon-based or CMOS, have a flat, rigid substrate and would not perform properly when attached to colloids that can experience complex mechanical stresses while travelling through the environment. In addition, all such chips are "very energy-thirsty," Strano says. That's why Koman decided to try out two-dimensional electronic materials, including graphene and transition-metal dichalcogenides, which he found could be attached to colloid surfaces, remaining operational even after after being launched into air or water. And such thin-film electronics require only tiny amounts of energy. "They can be powered by nanowatts with subvolt voltages," Koman says. Why not just use the 2-D electronics alone? Without some substrate to carry them, these tiny materials are too fragile to hold together and function. "They can't exist without a substrate," Strano says. "We need to graft them to the particles to give them mechanical rigidity and to make them large enough to get entrained in the flow." But the 2-D materials "are strong enough, robust enough to maintain their functionality even on unconventional substrates" such as the colloids, Koman says. 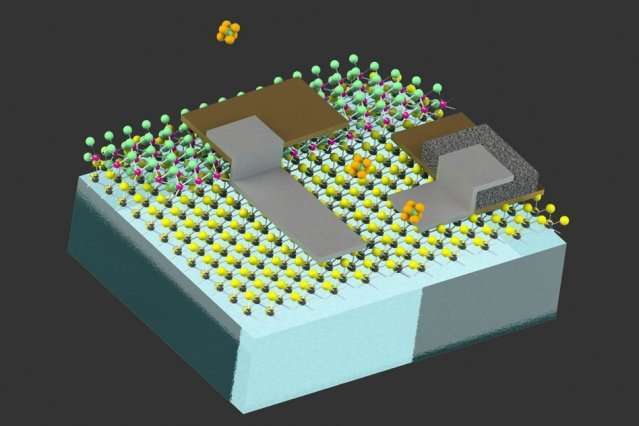 Other efforts at nanoscale robotics "haven't reached that level" of creating complex electronics that are sufficiently small and energy efficient to be aerosolized or suspended in a colloidal liquid. These are "very smart particles, by current standards," Strano says, adding, "We see this paper as the introduction of a new field" in robotics.